Anthem Javelin types include four variants in total. Each Javelin has its own unique abilities and capabilities, making them better suited for different fights and party compositions. Here are all the Javelins in Anthem, plus their specialties. The first Javelin Anthem players will gain access to is the Ranger. The Ranger is Anthem's all-arounder. It doesn't have the sharp specialization of the other classes, but it can do almost anything well. The Ranger can wield any weapons but heavy weapons, and comes with a built in Shock Mace melee ability that electrocutes enemies. The Ranger's first gear slot is for grenades that can have wide-ranging effects, while its second gear slot is for wrist-mounted weapons. Those weapons include homing missiles, an energy pulse, a spark beam, venom darts and a blast missile. The Ranger's support option can be either a spherical shield to block enemy projectiles or a damage boost for teammates in range. Finally, the Ranger's ultimate ability is a multi-target missile battery. Colossus Javelins are the tanks of the Anthem world. They can deal massive damage either at melee range or from long distances, without much in-between. They're the only Javelins that can employ heavy weapons​, but can't use pistols or submachine guns. The Colossus' melee ability is Heavy Smash, a high-damage attack that can also apply some crowd control. Its first gear slot is for shoulder mounted weapons that deal high damage at extreme ranges. Its second gear slot holds its Heavy Assault Launcher, which can include a cannon, a flamethrower, or one of several other options. The Colossus' support ability lets it taunt enemies to attack it or give all nearby enemies a damage resistance buff. Its ultimate, the Siege Cannon, is a big old cannon. Storm Javelins are Anthem's mages and glass cannons. They can put out a lot of damage, but can't take as much of a hit as the rest of the Javelins. They also float around by default, rather than walking, and can use any weapons except heavy weapons. The Storm's melee ability, Fiery Strike, knocks enemies away from it. The Javelin also uses Seals instead of gear. These seals can be used to freeze enemies, light them on fire or surround them with an electrical storm. The Storm's support seals can be used either to create a wall against enemy projectiles or to provide cooldown reductions to teammates in an area. Its ultimate ability is called Elemental Storm, and it unleashes a flurry of different elemental attacks in a set order. The Interceptor is fast and agile, with a focus on melee attacks. Playing the Interceptor well will often come down to a player's mastery of its movement abilities. Its melee ability, Double-Bladed Daggers, is its primary attack, dealing a ton of damage very quickly. Its first ability can freeze, coat in acid or electrocute as the player chooses. Its second ability has similar variety. The Interceptor's support ability can either mark a target to receive extra damage or remove status effects from all nearby allies. Its ultimate ability is also blade-related, letting it draw a pair of swords and gain resistances for more frenzied attacks. 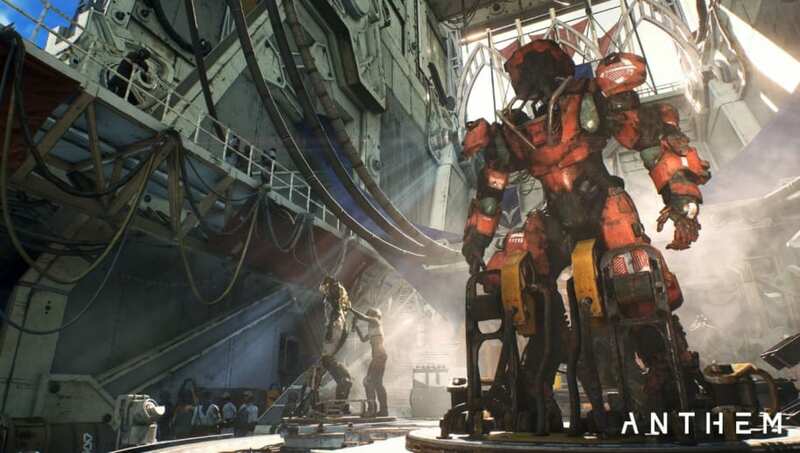 Mixing and matching customized Javelins is the key to success in Anthem. The game is set for a Feb. 22 release.